Locality: United States, Arizona, Mohave County, Sitgreave Pass in Black Mountains, 4 mi north of Oatman. Verbatim Elevation: 3500 - 4000 ft. 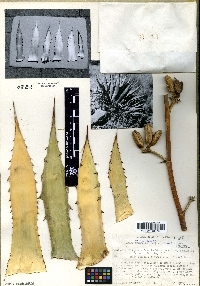 Occurrence Remarks: Small scattered population of small plants, sparingly suckering; leaves light glaucous green, variable; panicles small, narrow, 2-3 m tall with 12-20 laterals in upper half, clusteres small; fls. small, ovary light green, tepals yellow, spreading. Mostly fruiting on last tip info. collected at anthesis.